Scientists and nutritionists nowadays recognize that enzymes are life energy, life force or vital force. Without the life energy of enzymes we would be nothing more than a pile of lifeless chemical substances: vitamins, minerals, water and proteins. In both maintaining health and healing, enzymes do the actual work. In metabolism, they are the body's labor force. Each one of us is given a limited supply of bodily enzyme at birth. This supply, like the energy supply in a new battery, has to last a lifetime. The faster you use up your enzyme supply, the shorter your life. Guarding against the loss of precious enzymes can extend your life and make you healthier. The practices of cooking food and use of processed chemicals, drinking alcohol, using drugs, and eating junk foods all can draw out tremendous quantities of enzymes from our limited supply. When a body is in a weakened enzyme-deficient state is a prime target for cancer, obesity, heart disease, or other degenerative problems. A lifetime of such abuse often ends in the tragedy of death at middle age. Digestive enzymes have three components that go with the job that they perform. Proteases digest protein; Amylases digest carbohydrates and Lipases digest fat. Natural food enzymes from raw foods help to aid digestive enzymes so that they don't have to carry the full work load of digestion. When food enzymes do some of the work, the digestive enzymes are not as greatly depleted. Enzymes build our bodies from proteins, carbohydrates and fats, just as construction workers build our homes. Enzymes aid in converting food into new muscle, flesh, bone, nerves and glands. Good health depends on this enzyme potential to be continually replenished. This superior quality enzyme product is now being offered at a reasonable price to the public. Manufactured by the world renowned Wu Shin Enzyme Lab in the garden county of Chiayi on the beautiful island Taiwan. 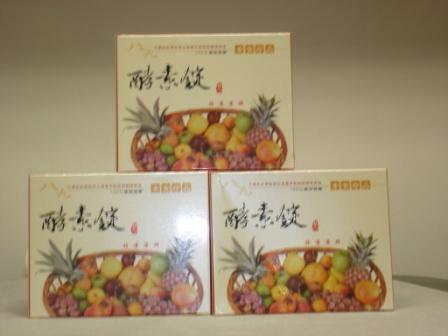 It is made of more than 10 kinds of tropical/subtropical fruits and green vegetables. The benefits of AAA Compound Enzymes are beyond words. Fruity tasting tablets contain the three food enzymes (Proteases, Amylases and Lipases). Combined with abundant Maltase (which reduce maltose to dextrose) and Intestinal Enzyme help aid digestion and fight enzyme depletion. AAA Compound Enzymes are widely consumed in China, Japan, Singapore, Taiwan and many Southern Asian countries. It helps to eliminate gas, flatulence, constipation, stomach ache and discomfort. More importantly it can help weight management. According to the statistics, in one month 5 to 10 pounds can be lost by taking three tablets a day before meals.